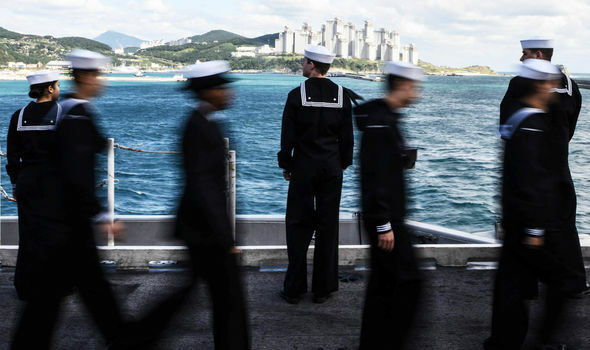 In a show of strength against Kim’s regime, US and South Korean commanders met onboard the flagship of the US Seventh Fleet today to warn the despot they are ready to “fight tonight”. 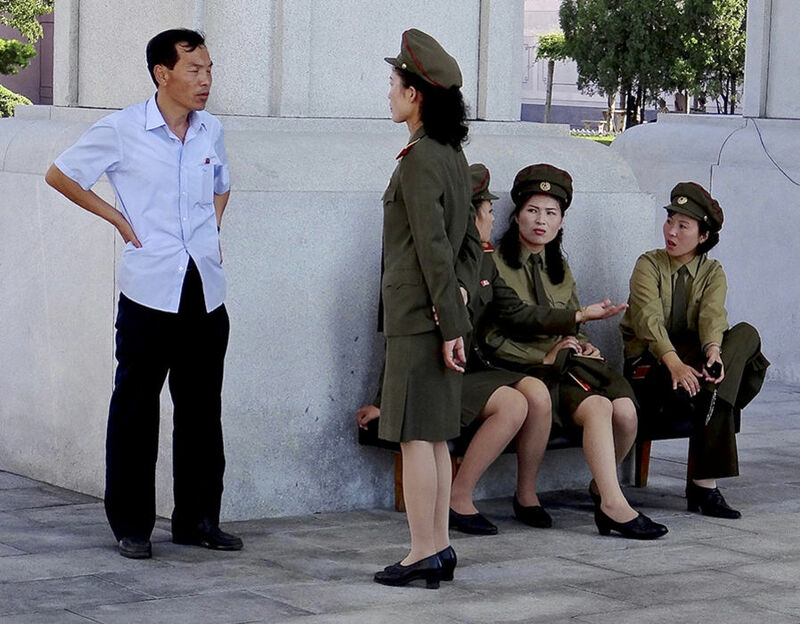 The warning comes during an “unprecedentedly grave security situation” on the Korean Peninsula as the allies wrap up five days live-fire drills at sea – exercises unpredictable Kim has labelled a “rehearsal for war”. North Korea has continued to provoke the West by testing nuclear weapons as well as long-range ballistic missiles, raising fears of World War 3 breaking out in the region. And today, Senator Bob Corker warned the President was “taking the US on a path to combat” with his approach to the rogue state. General Jeong Kyeong-doo, chairman of the Joint Chiefs of Staff, and US Forces Korea chief General Vincent Brooks met aboard the massive aircraft carrier USS Ronald Reagan. The Yonghap News Agency reports General Jeong Kyeong-doo as saying: “Amid an unprecedentedly grave security situation, the deployment of Ronald Reagan and its carrier strike group to the Korean Peninsula and their joint exercise with South Korea is part of the increased deployment of US strategic assets here. 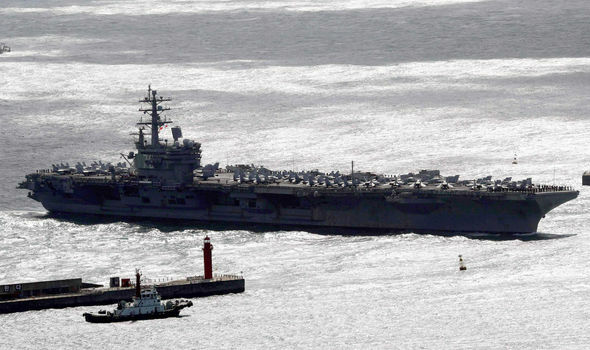 South Korean naval vessels have been training alongside the nuclear-powered USS Ronald Reagan, which can launch up to 90 state-of-the-art warplanes. And it emerged last week nearly 50 American heavy attack helicopters had been brought in to take part in the latest exercises over concerns North Korean special forces could try to invade the south by sea. General Jeong Kyeong-doo added: ”The latest joint exercise has been an opportunity to further improve the ability to carry out joint operations. Defence Minister Itsunori Onodera told Reuters: “The threat posed by North Korea has grown to the unprecedented, critical and imminent level. Both American and South Korean troops stationed in East Asia have maintained a combat readiness motto of “ready to fight tonight” in case unpredictable Kim launches a preemptive strike or attempts an invasion of SEOul. This week’s naval drills are just the latest in a series of exercises by the allied forces. American bombers, escorted by stealth fighter jets, have been flying missions in international airspace along the hermit state’s border for months. And US commanders recently vowed to continue the sorties, despite a warning by Kim’s regime that it “reserved the right” to shoot them down. Meanwhile, President Donald Trump and the North Korean despot have continued to trade insults and threats. Mr Trump has previously warned Kim he would “totally destroy” the north if it dared attack the US or one of its allies. In response, the dictator called the President “mentally deranged” and said American would “pay a dear price” for its threats. 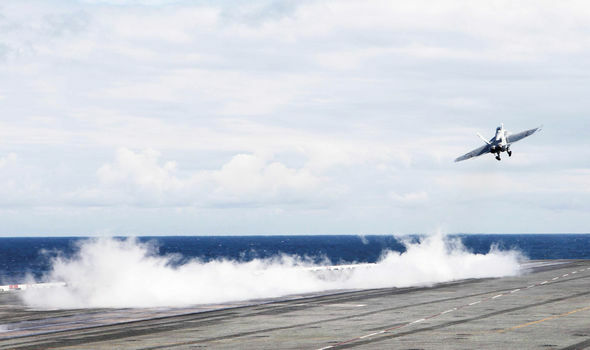 The Nimitz-class USS Ronald Reagan was deployed to East Asia in May. The 100,000 ton carrier took part in exercises with Japanese forces before sailing to South Korea for the latest round of drills. Last month, Kim’s state media service broadcast a clip depicting the destruction of American planes and the USS Carl Vinson, another of the US navy’s Nimitz-class carriers. The 99-second propaganda montage spliced footage of real missiles firing from ground and sea-based launchers before slamming in to computer generated images of US warplanes and ships.